Dean Faculty of Agriculture Prof. Keregero J. B.
Prof. K.J.B. Keregero, is an experienced academic who, over the years, has grown through the ranks from Tutorial Assistant to Full Professor. He has worked at the University of Dar-es-Salaam and Sokoine University of Agriculture in Tanzania, University of Swaziland in Swaziland, and the Lesotho Institute of Public Administration and Management and the National University of Lesotho in Lesotho. During his long academic career, he has taught undergraduate and postgraduate courses, mostly in agricultural education, agricultural extension and rural development, and supervised undergraduate and postgraduate student research in these areas. He has undertaken and led numerous research and development projects and successfully completed a wide range of community service activities. He has undertaken and successfully completed numerous consultancy projects for local and international clients, including governments and government institutions, non-governmental organizations and bilateral and multilateral institutions. He has written and published chapters in books, papers in refereed journals, papers in conference and workshop proceedings, and consultancy and commissioned reports. Prof. Keregero has served as an administrator in various capacities, namely: Head of Department and Foundation Director of the Centre for Continuing Education in Agriculture (University of Dar-es-Salaam), Foundation Director of the Institute of Continuing Education (Sokoine University of Agriculture), Foundation Director of the University Planning Centre (University of Swaziland) and Director Academic (Lesotho Institute of Public Administration). He has also served as member of Academic Staff Appointments Committee, Senate and Council at Sokoine University of Agriculture and University of Swaziland; member of Academic Staff Appointments Committee and Senate of the University of Dar-es-Salaam; and member of Council of the Inter-University Council for East Africa. While at the University of Swaziland, he pioneered the development of the very first strategic plan of the institution, “UNISWA’s Commitment to Self-renewal: University of Swaziland Strategic Plan 1999/2000 – 2004/2005”. 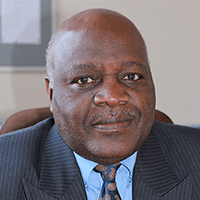 He is in his second term as Dean and is a member of the Senior Management Team, Academic Staff Appointments Committee and Senate of the National University of Lesotho. The Office of the Dean is responsible for providing leadership and administration of the academic and enterprise development functions of the Faculty. The academic functions involve teaching and facilitating learning, conducting research and providing community service. These functions are managed through Heads of Departments with the support of Faculty Tutors, Assistant Registrar and Farm Manager. The enterprise development functions are managed through the Faculty of Agriculture Business Hub whose Faculty Enterprise Unit currently oversees the operations of the NUL Restaurant, the Yoghurt Production Unit, and provision of short courses and consultancy services. Prof. K.J.B. Keregero – Dean. Dr. B.E. Mapeshoane – Head, Department of Soil Science and Resource Conservation. Dr. P.A.M. Matebesi-Ranthimo – Head, Department of Animal Science. Dr. M. Liphoto – Head, Department of Crop Science. Mr. A.M. Rantlo – Head, Department of Agricultural Economics and Extension. Mr. M. Ntakatsane – Tutor, Years I and IV. Mr. T. Nkheloane – Tutor, Years II and III. Mr. P. Mosebi – Tutor, Field Attachment. Dr. M.V. Marake – Head, Faculty Enterprise Unit. Ms. M. Lethunya – Assistant Registrar.